Kaanapali area: MauiGrown Coffee Company Store. This is the real deal. They roast their own coffee (they brought in a Portland guy to run the place, that should tell you something.) Look for the big smoke stack in Lahaina, and you’ll find this gem. Kahului: [updated 12/30/13] Maui Coffee Roasters is far from the resorts and tourists. Inside it looks like a coffee shop in Portland, complete with Godzilla inflatable hanging from the mirror. And the coffee was excellent, as good as we get in coffee-snob Portland! Kihei area: Lava Java serves up a great cup, and the owner really knows his beans.Java Cafe is also a great place to enjoy locally sourced coffee in Kihei. Pa’ia: Anthony’s Coffee is on the main street amidst all the activity. Along with great coffee, they offer yummy treats, and that great Pa’ia vibe. 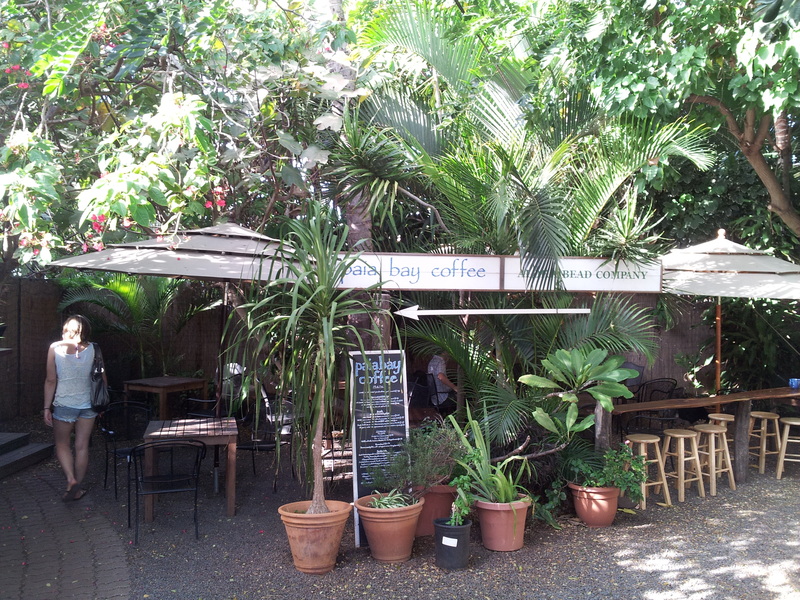 For an even more laid back experience, go to Paia Bay Coffee. Good java, and a great outdoor seating area that is a great place to cool off after time in the sun. Wailuku: If you want to get away from the tourist centers, and just relax at a legitimate coffee house, Wailuku Coffee Company is the ticket. Mostly locals hang out here, so leave the Maui Revealed book in your car. How about you? What is your favorite place to enjoy a little coffee on Maui? Those of us in Portland know how lucky we are to have such a vibrant food cart scene. 808 Grinds is one of my favorites because of the authentic Hawaiian-style plate lunches they serve up. I’ve come to know the owners over the past year or so, and was even privileged to play a little slack key guitar in front of their cart last year. I caught up with one of the owners, Kevin, to get the inside scoop on this popular Portland food cart. Both Kevin and his business partner Jensen grew up in upcountry Maui in the Pukalani/Makawao area. This explains why 808 Grinds is da real thing! They both learned to cook from their families…their food is truly home-style and reflects what they grew up eating on Maui. Their most popular dish? Something they call 808 Fried Chicken, their version of a popular dish on Maui called Mochiko Chicken. Most days between 11am and 2pm on the corner of SW 9th and Alder you’ll find a gang of hungry downtown workers waiting to get their share of this and other delicious Hawaiian dishes. Kevin’s advice to those planning a trip to Maui was “don’t plan so much”. Indeed it is a typical mistake to over plan a visit to Maui and cram pack it with too much activity. I asked Kevin what he missed most about Maui and he replied instantly “family and friends”. He also misses poke, a Hawaiian-style sushi, and the abundance of fresh fish everywhere. Kevin’s local’s advice on where to eat on Maui? His first recommendation is Tasaka Guri Guri at Maui Mall where they’ve been serving up a local concoction that is a hybrid between ice cream and ice milk for nearly 90 years. Also on his list is Sam Sato’s in Wailuku for Maui-style noodles, Da Kitchen, and the must visit Komoda Store and Bakery in Makawao. There! How’s that for a local’s take on where to eat on Maui? 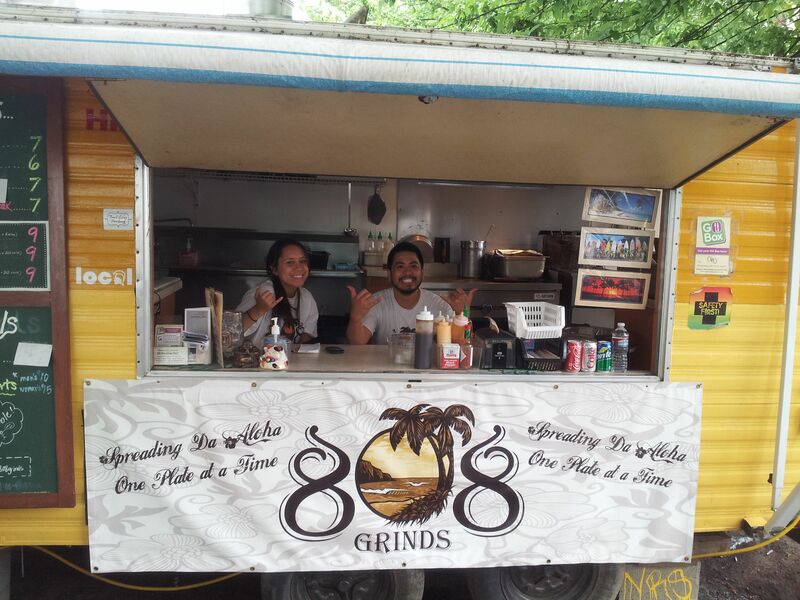 I hope you find yourself in Maui sometime in the near future so you can sample some of the local fare…but if you are lucky enough to live in Portland, Oregon check out 808 Grinds for the next best thing to being on the island!